Preheat Presto® Electric Griddle at 275°. Butter cut sides of English muffins; place muffins on griddle buttered side down. Place Canadian bacon slices on griddle. Crack eggs on griddle. 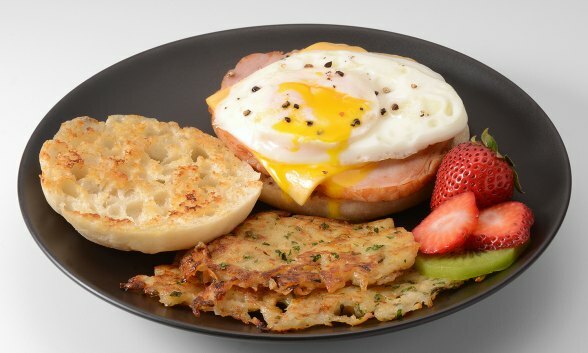 Heat until muffins are toasted, eggs are cooked to desired degree of doneness, and Canadian bacon is heated through. Assemble sandwich by placing ham and egg on one half of each English muffin, and top with cheese. Cover with remaining half of English muffin.